InfoLit India is a pilot project on Information Literacy (IL) for the new generation learners to make them effective users of information available in any format. 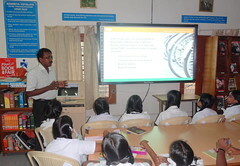 The project is aimed at developing the essential 21st century literacy skills (Information, Media and Library) in the students of Kendriya Vidyalaya Pattom, Thiruvananthapuram, Kerala (India) through instruction, training and research. The project is conceived on a basic information literacy curriculum developed according to the needs of students in an Indian education environment.